GERD or gastroesophageal reflux disease is a very common lifestyle disorder of modern-day living. While severe cases of GERD must be treated comprehensively, simple GERD precautions can help many people with mild GERD to avoid an aggravation of their symptoms. GERD happen when the lower esophageal sphincter at the junction of the esophagus and stomach normally keeps the food from traveling back into the esophagus. When the sphincter does not relax completely or relaxes at inopportune times the corrosive contents of the stomach regurgitate into the esophagus causing heartburn and symptoms of GERD. But this is only the anatomical explanation for the cause of GERD. Emotional and mental well-being is also now known to influence the digestion process. Certain other risk factors are also known to trigger off symptoms such as heavy meals containing fatty and fried foods, spicy foods, lying down immediately after a meal, eating prior to exercise, cigarette smoking, obesity, defective posture, alcohol intake, some medications, psychological stress, etc. Most doctors advise antacids or prescription medications such as proton-pump inhibitors. Although they provide relief of symptoms, albeit, temporarily, they have serious side effects and the disease is practically left untreated. 1) Avoid foods that cause the LES to relax like chocolates, caffeinated beverages, fatty foods, spicy foods, carbonated beverages, citrus foods, peppermint, etc. 2) Eat smaller, more frequent meals and avoid overeating. 5) Do not lie down immediately after eating. Wait for at least three hours after the last meal. Also do not bend after eating. Always bend at the knees than the waist. It puts less pressure on the abdomen. 6) Reflux of acid is more injurious at night than during the day. Elevate the head of the bed at least six inches. 7) A wedge pillow is also helpful. 8) Avoid tight-fitting garments especially around the waist and abdomen. 9) Chew sugarless gum between meals. This produces more saliva which is alkaline and helps neutralize the acid. The swallowing action will push the food back into the stomach. 10) Take it easy, take up an exercise regimen or yoga to help relieve stress. 11) Some studies have also linked excessive salt intake with development of GERD. Limiting salt intake is probably a wise precaution. 12) Regular use of antacids is extremely harmful in the long run. Prevention is always better and cheaper than cure. In more serious cases of GERD, a holistic approach to the problem of GERD is the only permanent way to solve this problem. A holistic practitioner will consider your body as a whole. The human body has physical, emotional, mental as well as a spiritual side. An imbalance among these leads to disease. To bring about a balance all these sides need to be treated. Only this will help in curing disease and lead to a healthy life. 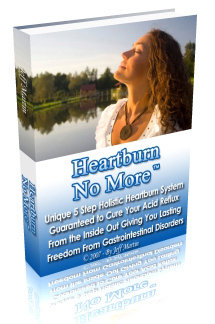 Discover How YOU Can Naturally Eliminate and Reverse Your Acid Reflux In Less Than 2 Months Without Resorting to Drugs or Risky Surgery.Guaranteed!